Welcome to Shadow Pines Cabin in beautiful Garden Valley! A wonderful bright sunny cabin on a dead end road near miles and miles of Idaho national forest land trails, and surrounded by sweet smelling pine trees. Perfect for family/ groups/ team building get-togethers with it’s open inviting floor plan, large outdoor and cozy gathering areas. The full length covered front porch complete with gas heater is amazing and includes a propane BBQ grill for entertaining. Large side porch is covered with a private hot tub with views of the open grassy area and fire pit. Entering the cabin from the front porch into the living area with the large mud/ laundry room on your immediate right and the wooden log staircase within view is very welcoming. The first floor boasts 12’ ceilings with a bank of huge windows topped with transoms letting in an abundance of natural light. A large screenTV is visible throughout the living/ kitchen/ dining areas with Roku steaming WiFi TV. There is a landline with a downstairs and upstairs phone. WiFi is available, a six port USB charger is conveniently tucked away next to the kitchen counter. Cell calls can be made through the WiFi as well. (You will have to confirm the settings on your phone.) The neighborhood geothermal pools are just down the road and are so relaxing after a day of snowmobiling, hiking, four wheeling, puzzle assembling, reading, or napping. The handicapped accessibility is an added bonus with a level entry, wide 36” pocket doors on the first floor, hard floors throughout, and a roll in first floor shower. There is one bedroom downstairs with a queen bed, a small toddler mattress is hidden under the queen bed to pull out for little ones. The second bathroom and two more bedrooms are upstairs boasting a twin and double/ twin bunk in the first bedroom, and a double and twin bed in the third bedroom. Out front of the cabin is a camper area with plenty of room for an RV. 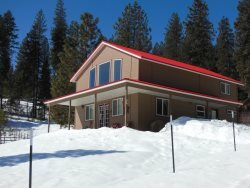 Come, bring your human and furry family members/ friends to reconnect, relax and enjoy each other and the beautiful surroundings at Shadow Pines Cabin. Everyone we talked to was absolutely fantastic and very friendly and helpful. It is a beautiful place and seemed to be very clean. It was great to have the handicap accessibility however the downstairs bed was way too high for my little old mother. The elk that came to visit one morning were added benefit. We had a great time and we're glad that we were able to extend our stay an extra day. We enjoyed it very much. The dirt roads were somewhat a hassle, but also a welcome change from the concrete world.